NATCHITOCHES, La. 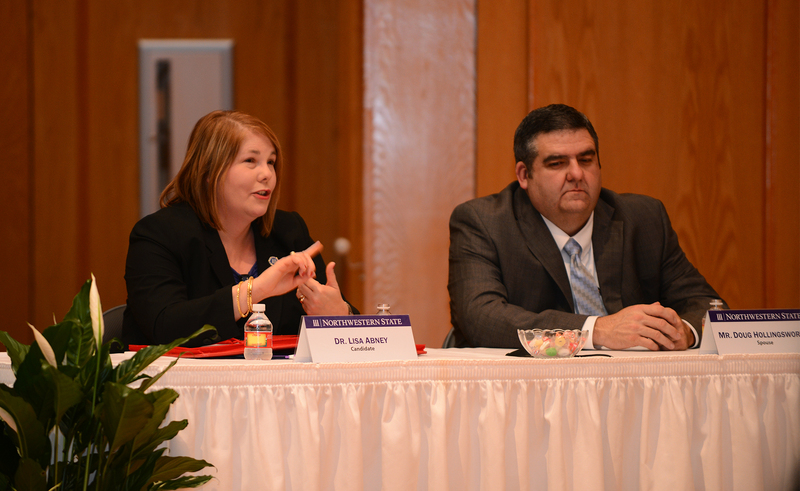 – After two days of public interviews and on-campus meetings with four candidates, the Northwestern State University Presidential Search Committee voted to recommend Lisa Abney and James Henderson to the Board of Supervisors for the University of Louisiana System. Plans are for the UL System Board to interview the finalists and select the new university president on Tuesday, Sept. 23, 2014, in Baton Rouge. Lisa Abney is Provost and Vice President for Academic and Student Affairs at Northwestern State University and has worked at the university since 1997. Prior to Northwestern, she held a faculty position at the University of Houston-Downtown. She has a bachelor’s degree in Spanish and a master’s degree in English from Texas A&M University. She holds a doctoral degree in English from the University of Houston. During her interview Abney shared her philosophy on leadership. “The leader of this university has to be someone who can build consensus. You have to share information when you have it and maintain visibility on campus,” she said. James Henderson is Chancellor of Bossier Parish Community College. Prior to becoming Chancellor, he served as Senior Vice President for Workforce and Economic Development at the Louisiana Community and Technical College System. He has a bachelor’s degree in Journalism from Northwestern State, a master’s degree in Human Performance Technology from the University of West Florida, and a Doctor of Management from the University of Maryland. During his interview with the search committee, Henderson spoke of being a servant leader. “You have to be a champion of the university for the students you serve, the faculty, staff, and alumni. One of the most important things you can do is add value to degree that have already come through the university,” he said. The Board of Supervisors for the University of Louisiana System will hold a special meeting on Tuesday, Sept. 23 at the Claiborne Building in Baton Rouge (1201 N. Third Street, Baton Rouge, LA 70802). Although the start time has yet to be set, plans are to hold back-to-back public interviews with the finalists, deliberate, and select the new president. Plans are to webcast the meeting live. Voting members of the Northwestern Presidential Search Committee included UL System Board Members Edward Crawford III of Shreveport, Dr. Kelly Faircloth of Pineville, Board Chair E. Gerald “T-Boy” Hebert of Kenner, Student Member Adam Lefort of Thibodaux, Jimmy Long, Sr. of Natchitoches, D. Wayne Parker of Choudrant, Mark Romero of Lafayette, Carl Shetler of Lake Charles, Robert Shreve of Baton Rouge, and Winfred Sibille of Sunset. Also serving as a voting member is Northwestern Faculty Senate President Massimo Bezoari. Serving as advisory, non-voting members were Northwestern SGA President Kyla Winey, a junior mass communication major from Lafayette; Northwestern Foundation President Lola Dunahoe, a 1971 graduate in biology who works for The Dunahoe Law Firm in Natchitoches; and Northwestern Alumni Association President Joe Stamey, a 1983 graduate in accounting who is a partner in the Natchitoches-based Stamey and Miller Law Firm. UL System President Sandra Woodley serves as the non-voting committee chair. 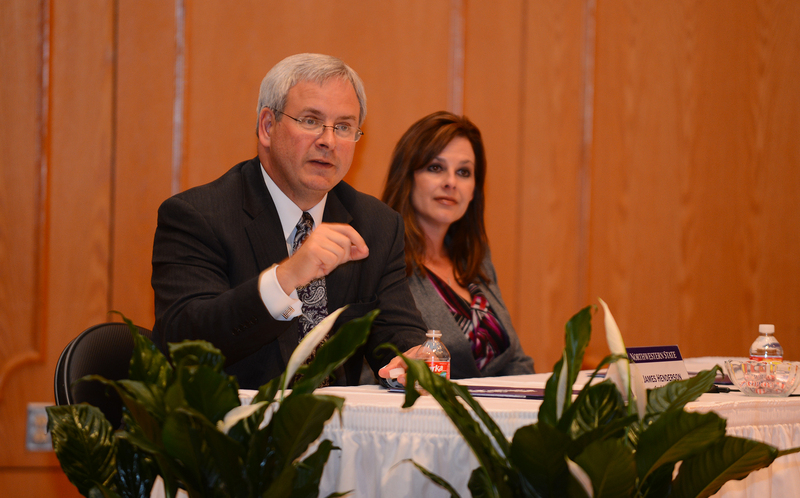 Northwestern State’s longest-serving president, Randall Webb, announced his retirement in April.